The article provides facts and information about Native American's land. The Tribe location map provides a general overview of the tribal territories of various tribes of Native Indians. 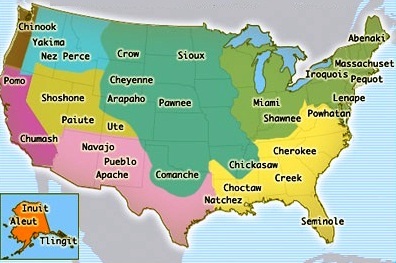 A bird's eye view of the Native American's Land and their tribal territories. The late 1700's saw Pontiac's Rebellion in 1764 and Lord Dunmore's War in 1775. The Chickamauga Wars (1776–1794) saw the Cherokee involvement in the American Revolutionary War which continued through late 1794. The beginning of the 1800's saw Tecumseh's War and the Battle of Tippecanoe (1811–1813). 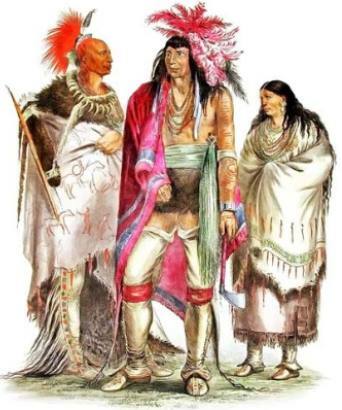 The Creek War (1813 -14) and the Peoria War was the conflict between the U. S. Army, settlers and the Native American tribes of the Potawatomi and the Kickapoo tribes. The Wars over land between the Native Americans and the European settlers escalated with the Winnebago War, the Black Hawk War, the Osage Indian War, the Navajo conflicts, the Sioux Wars, the Apache Wars, the Ute Wars, the Nez Perce War and the series of Seminole Wars. The Battle of Wounded Knee was fought in 1890. Through sheer numbers the Native Americans were defeated by the US Army and the European settlers. Native Americans Land. Discover the vast selection of pictures and videos of Native Indians. The pictures show the clothing, weapons and decorations that can be used as a really useful educational resource for kids and children of all ages. Our series of videos enable fast access to the images, pics, paintings and pictures together with information and many facts. We hope that this article on Native Americans Land will assist in your studies or homework and that you will enjoy watching the videos featuring many pictures of the Indians. A great educational resource for kids on the subject of Native American Indians.